I’ve never been a fan of the superheroes that populate the Marvel Universe, but this film made me a believer. 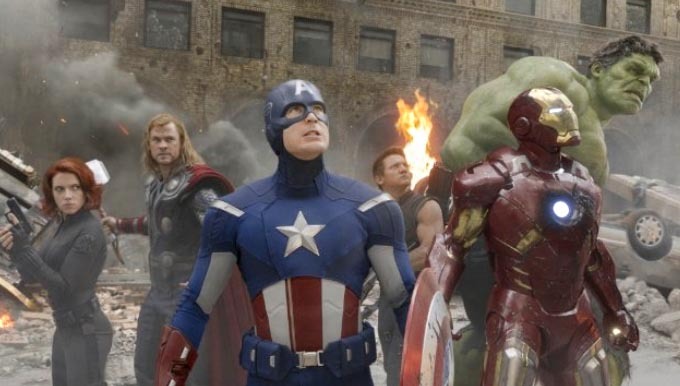 Vivid, exciting, with witty dialogue and wonderfully conceived action sequences, “The Avengers” is a winner all the way! The action scenes are carefully designed, choreographed and executed. They’re a delight to watch, especially since the camera doesn’t bump, grind and shake like other routine action films. With expert use of CGI, Manhattan receives a thorough trouncing, receiving more damage than anything Godzilla could unleash on Tokyo. (We like to think that it’ll be all repaired in time for the sequel). The Avengers sports a great ensemble, both in conception and casting; Tony Stark/Iron Man ( Robert Downey Jr.), Natasha Romanoff / Black Widow (Scarlett Johansson), Thor (Chris Hemsworth), Steve Rogers / Captain America (Chris Evans), Bruce Banner / The Hulk (Mark Ruffalo), Clint Barton / Hawkeye (Jeremy Renner ). They’re a superb team, and their quick, witty repartee further fortifies their relationships. Samuel L. Jackson returns to familiar territory as the fastidious Nick Fury. Tom Hiddleston gives an over-the-top performance as the megalomaniac, Loki. Gwyneth Paltrow and Clark Gregg return in supporting roles. Harry Dean Stanton appears in a nice bit part. An all-time winner for summertime family entertainment (PG-13). Highly recommended.